iTriage empowers you to take your healthcare into your own hands. 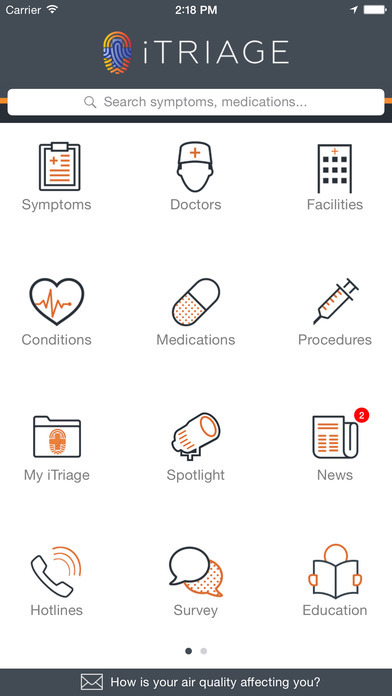 Founded in Denver in 2008 by two emergency room doctors, the app connects patients and providers; provides valuable information on healthcare; saves your personal healthcare history and insurance information, and more. iTriage makes the process less frustrating and disjointed by delivering personalized data insights that put the consumer at the center of their healthcare. With over 15 million downloads, and an average rating of 4.5/5 stars from over 100,000 reviews, iTriage received overwhelming positive feedback for their consumer-oriented healthcare app. It was the first mobile app to provide Emergency Room wait times, provides medical content that received the Harvard Medical School "stamp of approval," and is backed by insurance powerhouse, Aetna. In 2011, Aetna acquired iTriage, which, according to Michael Palmer, former Chief Innovation and Digital Officer at Aetna, was largely due to their innovative technology. Palmer said that the app's "extremely consumer-focused technology" is becoming increasingly important with the national push to streamline healthcare and put decisions into the hands of the consumer. The acquisition gave iTriage financial strength, along with allowing the Denver-based company to add new employees and move into an upgraded office space. Lucky for us, iTriage is largely independent from Aetna and stays connected to the Denver startup community. The backing from Aetna, the company says, allows iTriage to hire top talent and find new, unique solutions—all while playing ping-pong, wearing flip-flops, and enjoying the many other perks of startup life. While Aetna provides financial strength and opportunity, the insurance giant does not take part of any decision making for iTriage, keeping the company to its roots, which co-founder Dr. Wayne Guerra called a "startup with benefits." Learn more about iTriage here or download the app.